Audi Sport launched their 2016 LMP1 contender, now dubbed simply Audi R18, with a webcast earlier today showing the final design of the car, and the 2016 FIA WEC livery. The new Audi has been redesigned from scratch with almost nothing in common with its predecessor. The car features a more radical aerodynamic concept, including a new safety cell, its hybrid drive system is battery-operated for the first time, the V6 TDI engine has been revised too with multiple new systems added into the mix. As a result the new Audi is more powerful and more efficient than its predecessor, consuming less fuel than any of the generations before it. The combined power output of the TDI engine and hybrid system is more than 1,000 hp but with a 10% percent reduction in fuel consumption. 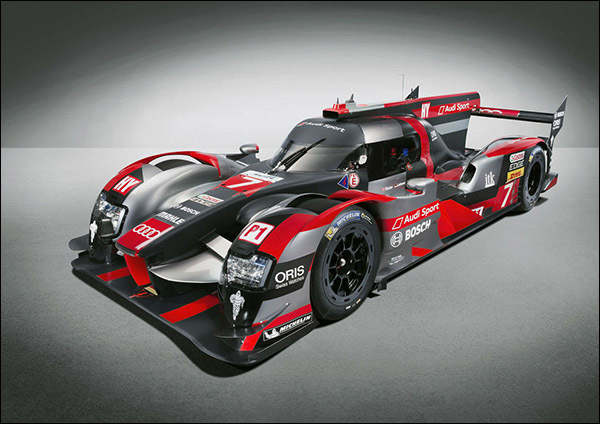 All development engineers at Audi Sport were challenged to enhance the efficiency of the Audi R18. As a result of switching to the 6-megajoule class, the hybrid system now recovers 50 percent more energy. The car’s aerodynamics concept is fundamentally new. Nearly all vehicle systems have been refined or redesigned. Consequently, energy consumption decreases, the race car has become lighter, and allows for more favourable packaging of the component assemblies. This has resulted in an R18 which even visually clearly differs from its predecessor. 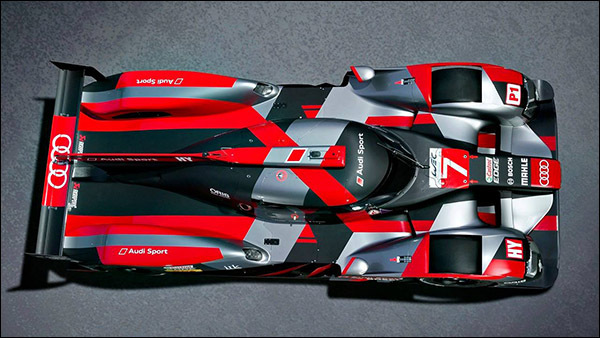 The new Audi R18 is visually very different from its predecessors. The proportions of the front end and the cabin within the overall vehicle length have changed and the conspicuous nose of the race car is clearly slimmer than before. “The new proportions influence weight distribution and aerodynamics,” explains Jörg Zander, Head of Engineering at Audi Sport. “Our most important objective was to improve airflow.” At the front end, airflow has to be directed across the top of the race car and between the wheel wells, enter the cooling ducts through the body shell, and optimally approach the underfloor. “In this process, vortices must be avoided, as this costs energy,” says Zander. Undesirable vortices and turbulent flow reduce the energy in the airflow and increase resistance. The smaller the space which the monocoque occupies in this area the larger are the clearances for low-loss airflow. Thanks to the new proportions, the new Audi R18 directs airflow even more effectively to optimally approach the underfloor. At the rear, the air exits again through the diffuser. As a result, it produces a major portion of the downforce under the race car, which is beneficial in cornering. Audi developed a new monocoque, modified the proportions within the prescribed maximum length of 4,650 millimetres, and designed all the component assemblies accordingly. Due to the new monocoque, the mounting points for the front suspension have significantly changed. To make them more compatible with the position of the drive shaft for the hybrid system, the new mounting points have been rearranged. Suspension kinematics have been significantly revised. Wishbones featuring a new design are now used for wheel guidance. The lift and roll spring-damper elements are actuated via pushrods at the front. The rear suspension kinematics has been optimised as well. As in the case of the previous-generation vehicle, the spring-damper elements are controlled using pullrods. 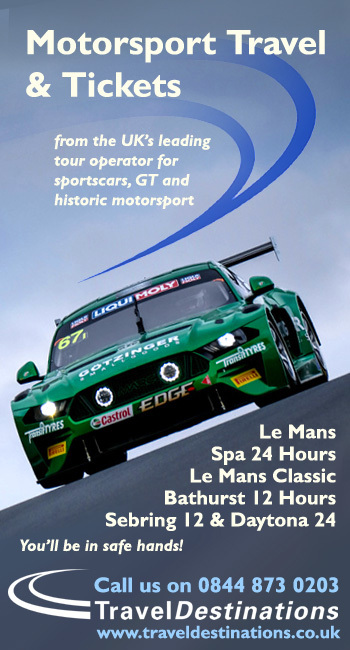 Optimum balance of the race car in all speed ranges is guaranteed by balancers of the Linked Suspension System (LSS) in the chassis. The transmission is a new design as well. Audi’s simulations revealed that the optimised engine allows a very good gear ratio spread with minimal rpm jumps even in combination with a six-speed instead of the previous seven-speed unit. As a result, the engineers managed to further reduce the weight of the transmission. In the other areas of the vehicle’s structure, Audi rigorously pursued its lightweight design approach as well, while retaining the high torsional stiffness of the chassis. Audi was the first manufacturer to win the Le Mans 24 Hours with an energy recuperation system, using a flywheel energy storage system from 2012 to 2015. For 2016 a battery will be accumulating the energy. Electrokinetic technology is being replaced by an electrochemical storage system. The previous flywheel accumulator guaranteed high power density. Now, favourable energy density has to be achieved as well, as Audi is switching to a higher hybrid energy class. Starting in the 2016 season, the amount of energy will increase by 50 percent to 6 megajoules. When comparing this level with the one from the 2014 season, the engineers have even tripled the amount of recuperated energy within this period of time. For the first time, Audi will be relying on a lithium-ion accumulator as the hybrid energy storage system. 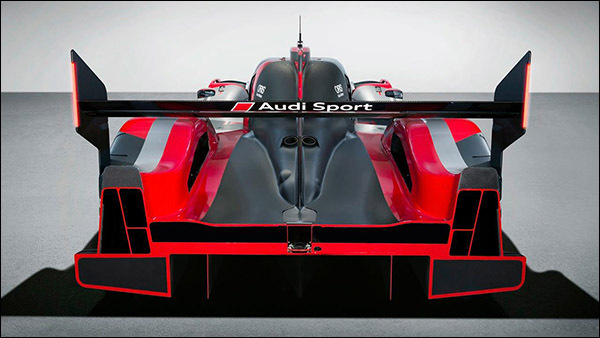 Since 2009, the batteries for the electrical system of Audi LMP1s have been based on this technology. The production-based cells of the new hybrid storage system use advanced and powerful cell chemistry and are serially connected. The system is located within the high-strength safety structure in the monocoque in their own cell. Electrical and electronic safety systems monitor various parameters – from individual cells through to the overall high-voltage system – and will intervene if necessary. The shutoff logic naturally includes crash detection. From the 2016 season on, there will be a track-specific limitation imposed on power output in addition to the previous energy classes. Although the MGU may recuperate any desired amount of energy, it may now only supply 300 kW (408 hp) in the race at Le Mans. Audi has designed its MGU for an output of more than 350 kW (476 hp) in order to recover as much energy as possible. The reason is that even when braking at high speed, the braking phases of an LMP1 race car last only three to five seconds. The high system output helps efficiently recover the required energy. At Le Mans, the system may only supply 300 kW during subsequent acceleration. Accordingly, the energy from the hybrid system will be available for a longer period of time. 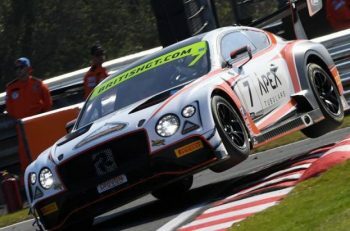 This limit does not apply to the other FIA WEC rounds. Whilst the developers of the hybrid drive system were allowed to increase output, the engine development team headed by Ulrich Baretzky was confronted with the opposite challenge for the 2016 season. The 4-litre V6 power-plant now receives less fuel, which initially reduces its output. Cionsider also that Audi switched to a higher hybrid energy class – and the regulations allocate less fuel to race cars which recuperate large amounts of energy. This aspect results in a minus figure in the power equation of about three percent. At the same time, another change is taking effect. 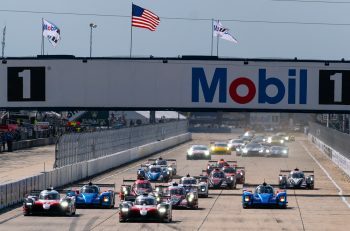 With development pushing forward the pace of LMP1 technology and with faster and faster lap times the FIA, the WEC and the ACO have now allocated less fuel energy to the hybrid race cars. “This is a development which, as a manufacturer, we principally support in order to control the lap times,” says Dr. Wolfgang Ullrich. The basic concept of the V6 TDI engine dates to 2011. With its double-flow VTG mono turbocharger, 120-degree cylinder bank angle, the exhaust gas side within the V angle, and innovative detailed solutions the unit tends to be regarded as unusual. The initial displacement volume of 3.7 litres increased to four litres in 2014. Among other things, the turbocharger is now lighter and more efficient. Externally, the V6 TDI has changed as well. Individual components are now arranged differently in order to make room for the new aerodynamics concept. The prescribed limitation of the charge pressure to a factor of 4 does not change the engine’s torque of more than 850 Newton metres. The higher efficiency pays off, as the fuel cell capacity of the race car has been reduced further as well – by eight percent to 49.9 litres. The current V6 TDI consumes 32.4 percent less fuel than the first generation did in 2011. This progress is even more substantial in a comparison with the original year of 2006. Back then, Audi used TDI technology for the first time. Since the diesel-fuelled TDI technology was adopted Audi have claimed eight Le Mans victories, a distance record, plus two world championship titles. The 2016 car uses 46.4 percent less fuel at Le Mans. Still, it achieves lap times that are ten to 15 seconds better than a decade ago with aerodynamics, lightweight design and the powertrain all making major contributions. Audi complements the exacting requirements of the regulations by in-house research that far exceeds these rules. In the field of active safety – in other words the detection of hazards and accident prevention – the Audi drivers can draw on a wealth of tools. Whilst the driver information monitor in the cockpit to display race control flag signals is prescribed, Audi has a number of other systems in play. Matrix LED headlights combined with Audi laser light optimize the light beam of the race cars that can reach speeds of up to 340 km/h. Since 2015, Audi customers have been able to order laser light in the second generation of the Audi R8 road car as well. 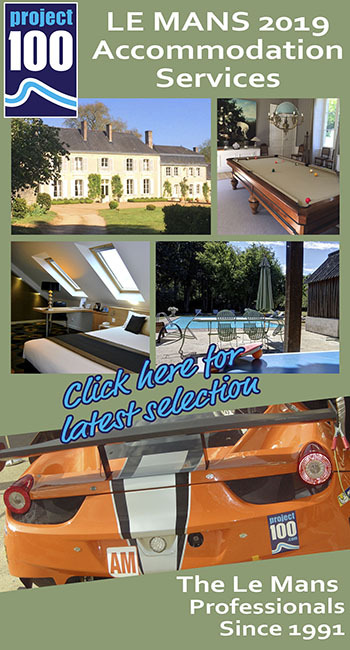 Matrix LED technology has been making its way into a growing number of model ranges. Particularly good rearward vision is provided by a lightweight and energy-efficient camera system in combination with an ultramodern AMOLED screen that serves as a digital rear view mirror. Since the 2001 season, the drivers and pit crews have been keeping their eye on tire inflation pressure using a tire pressure monitoring system. And, last but not least, the Audi R18 automatically controls brake force distribution with respect to the hybrid system in the respective operating condition. In the event that an accident cannot be avoided, the passive safety systems take effect. The monocoque consists of a high-strength CFRP structure with an aluminum honeycomb core and has a front crash nose for energy absorption. In 2011, Audi was the first manufacturer to use a single-piece monocoque. The cell has been provided with additional side impact protection, as Zylon layers integrated into the cockpit walls prevent the intrusion of objects. In rear-end collisions a CFRP structure at the transmission absorbs the impact energy. 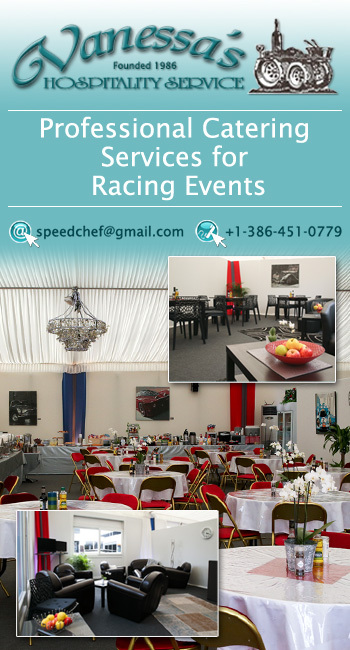 Double wheel tethers have been successfully used since the 2014 season and reduce the risk of wheels separating from the race cars in accidents. Due to their rotary motion, wheels have high levels of kinetic energy. The high-voltage protection systems ensure that the electrical currents in the hybrid system can be safely controlled. There is no other motorsport discipline that uses an equal amount of high technology to protect the driver before or during an accident. Previous article Tony Ave On Progress With The Ave Riley LMP3, "There Will Be LMP3 Cars In America"